WASHINGTON--(BUSINESS WIRE)-- Sixth paragraph, second sentence of release dated November 28, 2018, should read Gérard Mourou (instead of Gérard Moreau) and third sentence should read Holmdel, NJ (instead of Holmdale, NJ). 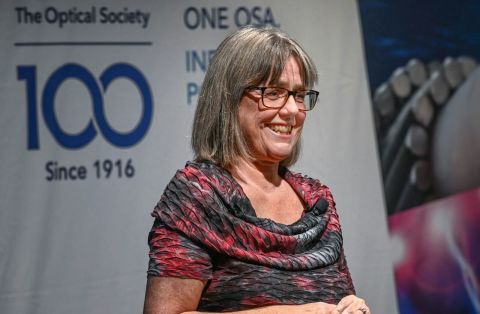 Donna Strickland, 2018 Nobel Prize winner in Physics, addressed staff at The Optical Society (OSA) on Tuesday, 27 November, in Washington, DC. Her remarks touched on the many ways her life has changed since the prize was announced on 02 October. Strickland, a professor of physics at University of Waterloo, Canada, was 2013 OSA President. She currently serves on both the OSA International Photonics Advocacy Congress (IPAC) and the OSA Public Policy Council. In preparation for her trip to Sweden to receive the Nobel Prize on 10 December, Strickland said, Swedish officials asked about her personal life. She mentioned that she likes tennis and immediately, she said, an idea was floated to invite tennis superstar Björn Borg to the Nobel ceremonies. “That’s the kind of treatment you get,” Strickland said of being a Nobel Prize winner. She also talked about the high-level access she now enjoys with the Canadian government, which agreed immediately to send officials to a conference she had been organizing before winning the Nobel. “I am telling you, all you have to do is win the Nobel Prize and you get to know your government leaders,” she said. Strickland is the third woman to have won the Nobel Prize in Physics. She was cited along with Gérard Mourou, École Polytechnique, Palaiseau, France and the University of Michigan, Ann Arbor, USA, for “their method of generating high-intensity, ultra-short optical pulses.” Arthur Ashkin of Bell Laboratories, Holmdel, NJ, USA also shares the 2018 Nobel Prize in Physics for his work on optical tweezers and their application to biological systems. Strickland was modest when discussing her innovative and ongoing work in laser science. “I was born under a lucky star, and it just keeps happening for me,” she said.